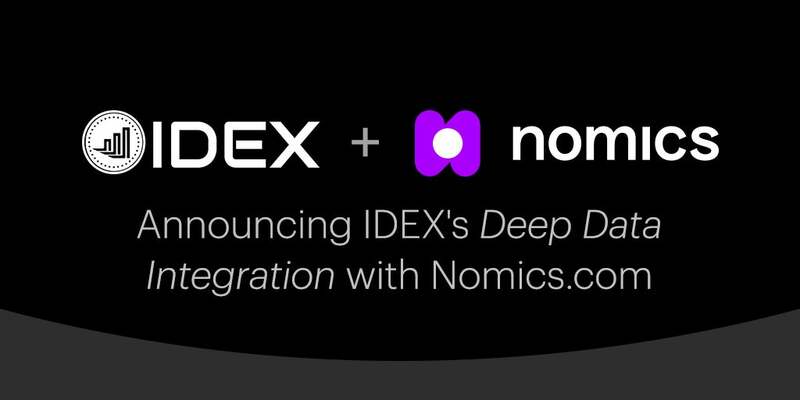 Today, we’re pleased to announce that IDEX (the leading decentralized crypto exchange) has become the first crypto exchange to complete a “deep data integration” with the Nomics.com data platform. 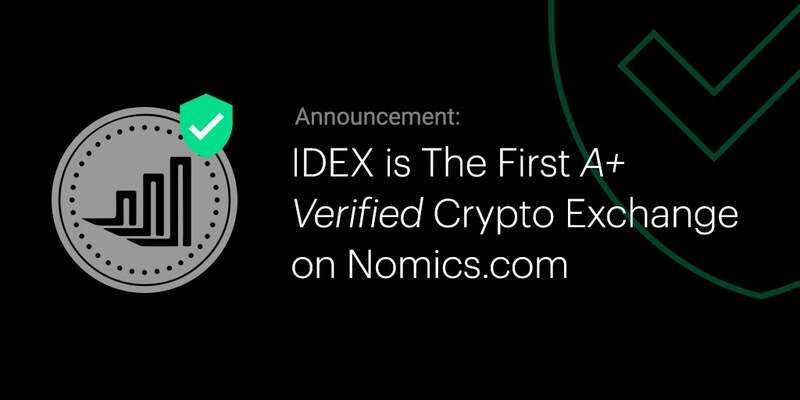 With this integration, IDEX also becomes the first A+ Verified Exchange on Nomics.com. With over 220k+ total users, IDEX is the most popular decentralized exchange by volume and is consistently the #1 Ethereum Dapp in the world by daily users, volume, and transactions. 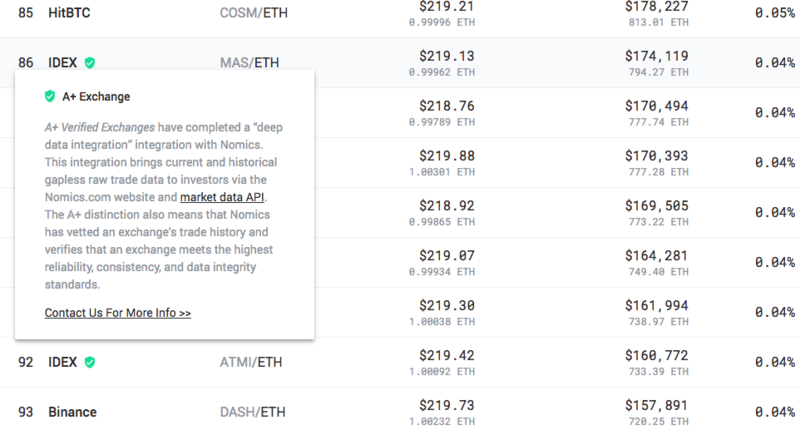 The Nomics.com API provides a free crypto market data API (with no rate limits) and is the only market data API with gapless and normalized historical raw trade & order book data. Here’s what this integration means . . .
IDEX has completed a “deep data integration” integration with Nomics; this integration brings current and historical gapless raw trade data to investors via the Nomics.com website and market data API. IDEX already had a fantastic API that exposes high-quality data; now that data is normalized across the Nomics dataset and available behind our API. 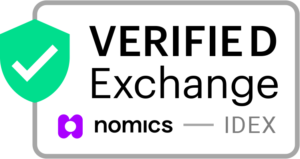 IDEX is the model for exchange operations and data, which is why we’re proud to list them as our first A+ Verified Exchange. They’ve been great to work with throughout this process, and have an excellent technical team. Normalized IDEX market data will be available to all API users. Nomics’ free crypto exchange data API comes with dozens of endpoints, including endpoints that return sparkline, exchange rate, all-time high (ATH), and supply data. Also included are historic candle/OHLC data for cryptoasset trading pairs. Users of Nomics’ paid API plan will get access to every trade on every IDEX trading pair market, going back to the inception of those markets. Note: If you are an exchange operator who would like to participate in our A+ Verified exchange program, please contact us. We’re really happy that IDEX and Nomics can bring this to the market. This is the first of several deep data integrations to come. P.S. When you have some time, you should check out some of the great other work that Aurora is doing. Aurora is a collection of blockchain applications and protocols, including IDEX—the first real-time decentralized exchange—that together form a decentralized financial and banking platform.